I don't usually try to recreate what I see in the sewing magazine photos. But when I saw Burdastyle Magazine's June cover featuring this dress, it reminded me of the coral sandwashed silk I've had stashed for some years. I was a bit suspicious of how the pattern would look made up. 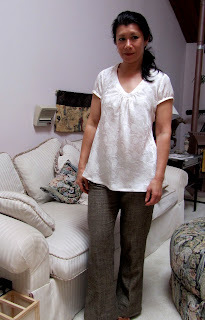 There is no waistline on the pattern, and it is cut so loose through the body. Will I regret making this? 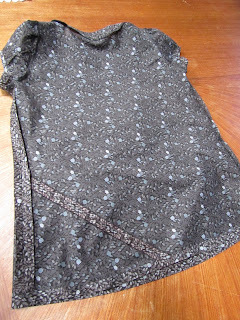 But on closer inspection of the pattern, I found that it is cut on the bias. Okay, just about everything I have made that is cut on the bias has turned out to have a pretty sophisticated look. I knew I wanted to make both a top and a dress with this pattern. Starting with some soft thin rayon in a lavender print, which I haven't found anything to do with before, I cut a dress muslin. While fitting the dress without the neckband, my concern was that the neckline would be too low. So I sewed into the shoulder seams another 3/8" which would have been equivalent to cutting the next size down, just in the shoulders. I guess this is an alteration I have done quite a bit except for sewing outerwear. In the front facing photo the silhouette looks quite big around the hips and waist, but because of the bias cut, moving around in the dress doesn't actually make it look that way. The neckband somehow looks a little narrow but, okay, that's the way the pattern is. And here is my sand washed silk! I pre washed it, and it had some hanging lines, which are now on the diagonal, but I was able to press them out so they are fairly faint. The silk hangs much more beautifully than the rayon. I almost thought I shouldn't cut it on the bias, but it is amazing this way. Next, to use another silk I have had since before our move to the West Coast! Beautiful ivory silk charmeuse with a jacquard. It's hard to see, but the design is tulips. Love it, and it feels like a dream. Finally, I have to show you how I got the blouse cut out of ONE yard of Liberty of London fabric! 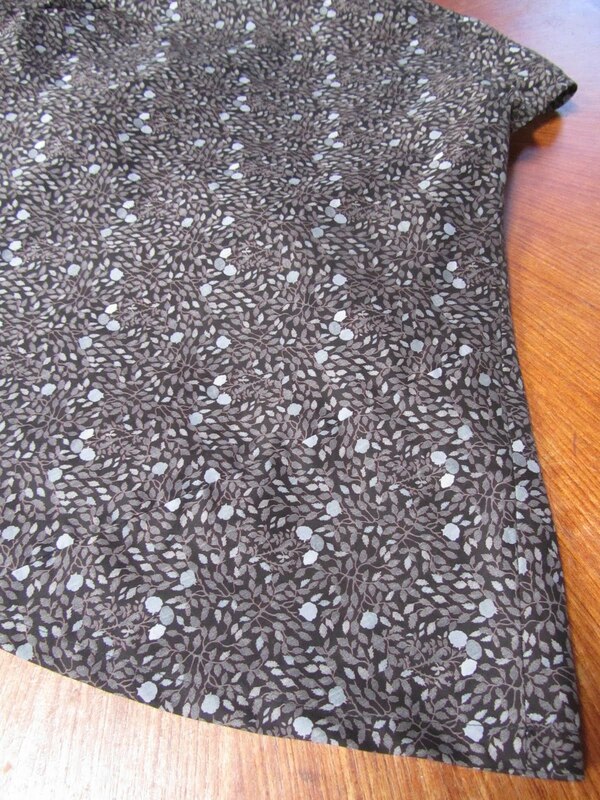 I bought this very pricey fabric (this is not like me) from B&J in New York city. Well, I was there and I had to choose something to bring back home! You know it's expensive! I asked if L of L ever goes on sale, and the clerk kindly said, "No." Okay, it does look kind of like a maternity top in the picture. But hey, maternity tops are "in"! Anyway, if my 17-yr old says it looks good, it looks good! So my first idea was to use the fabric for the JJ blouse. 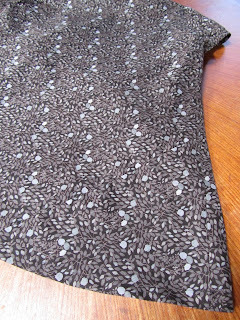 But luckily this pattern came along, and it is perfect because it has no buttons or buttonholes to mess up. 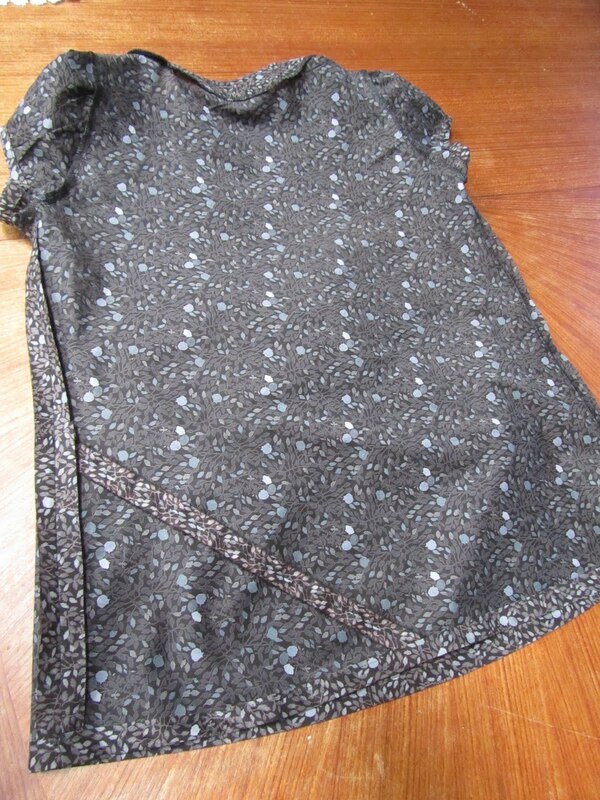 Now, to get it out of the 1 yard of fabric, I pieced the back corner. There is a photo of the inside, and one of the outside. I didn't actually plan to match the print, but it turned out fairly inconspicuous. One more useful tip for the neckline. Well, a few more. I widened the edge side of the neckband pattern pieces by 1/4". Somehow this just seemed more pleasing proportionally. And I was very careful to re-trace it so that is was more accurate. I was not happy with my accuracy in the previous 3 versions! Next, I block-fused the pieces. (Thanks, Pam!) Meaning, I cut the pattern pieces out after the fabric was fused to the interfacing. Much, much more accurate this way, and you actually don't take more time or fabric. Remember to stay-stitch and clip the curves, and then to understitch, and press well and carefully. Finally, the last tip which will save you lots of time is, to serge or finish off the edge of the neckband facing instead of folding it in. Then, stitch in the ditch or topstitch from the right side.